As part of Healthy Ireland, Thurles Library branch will host two mindfulness workshops for children on Saturday 2nd of February. These workshops will be facilitated by Tipperary Mindfulness practitioner Máire Shanahan. Mindfulness awareness exercises help children and young people to develop concentration, self-awareness and improve resilience. The first workshop will take place from 2.00pm-3.00pm and is suitable for children aged between 9-12 years. The second session will begin at 3.30pm-4.30pm and is suitable for teens 13 years plus. Our second Healthy Ireland event will take place on Saturday 16th February. Alexsandra Mitura will host a Zumba taster class for children in Thurles Library from 2.30pm-3.30pm. Zumba is an aerobic fitness programme, featuring movements inspired by various styles of Latin American dance and performed to Latin American dance music. Over 250 students completed our TYRAs (Tipperary Young Readers Awards) and will receive their awards on Saturday 16th February from 10.30am-12.30pm. The Book Clinic will be in the library from 10.30-1pm and 2-3.30pm. If you are a reader and looking for the next series to delve into or need a prescription for an exciting new read? Then pop along to Thurles Library and meet the CBI book clinic doctors. They will be ready to offer you advice and get a new personalized list of books to suit your reading tastes to take away! The Book Clinic is free of charge and a great way to discover new authors! 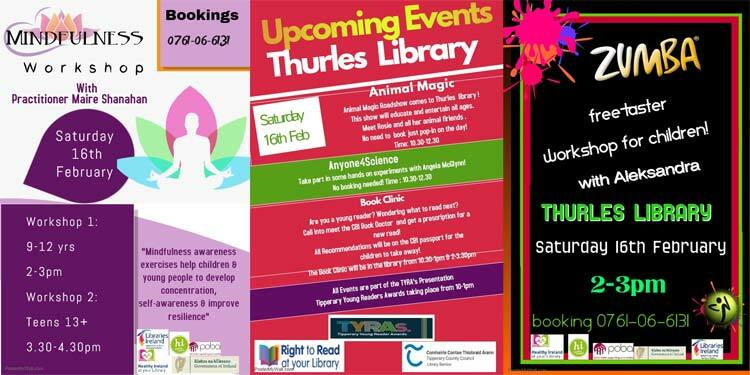 Animal Magic will be in Thurles Library on Saturday 16th February from 10.30-12.30pm. Pop in and meet Rosie Campbell and her animal friends. When you are finished learning all about animals why not turn your hand at some science experiments. Anyone4Science will host a drop-in workshop with Angela McGlynn form 10.30am-12.30pm. Note Please: All the events are free to attend and bookings are only essential for the Mindfulness and Zumba workshops. Contact: For further information please contact Tel No. 0761-06-6131 for any further details on any of the excellent events listed here above. Possibly the only shining positive John, I regret to say. Tipperary Co. Council have killed off the remainder.